It is often surprising for most travel enthusiasts to discover that while they have been off exploring distant places in search of a piece of Tibet, there are gems at their doorstep they haven’t a clue about. This place houses a world of its own. Since the 1960s, Tibetans have settled down in MKT, as it is locally known, and have built hotels, shops, monasteries and their entire lives here. This place is named after a ferryman who rowed people across the Yamuna as a service to god. He became so wrapped up in spiritual musings that people began to call him Majnu, after the legendary lover. The gurudwara built here was named after him. An ornate Buddhist-style gate stands at the entrance amid tall, dull structures that make the narrow alley look darker than it actually is. Ahead, the alley opens into a bright courtyard facing a monastery. People sit in the sun making momos and selling other unique food items such as fermented bamboo shoot. 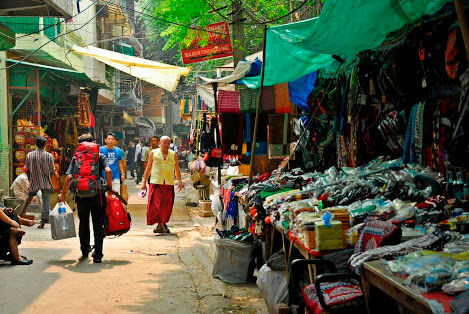 The winding bylanes ahead are full of Delhi University students, natives and tourists and are lined with shops selling Tibetan trinkets, travel agencies offering tours to Ladakh and Spiti, hawkers playing Tibetan songs and grocers selling exotic provisions. As dusk falls, incense smoke starts to float across the alleys and the tourists slowly begin to disappear. The chants of Om Mani Padme fill the air and calm your frayed nerves. The place can comfortably accommodate over 40 people and has a bright and sunny feel to it. 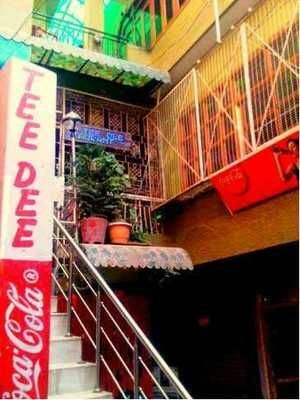 Tee Dee is done up in a traditional Buddhist manner with loads of laughing Buddhas and dragons. The menu comprises your everyday Chinese and Tibetan dishes, with their momos, noodles and thukpa being the crowning glory. A variety of other Tibetan dishes like the Gyuma (fried sausages), Shabhaley (fried momos) and Thentuk (noodles with soup) are Tee Dee’s speciality. Wash down your meal with their special apple beer. The average cost for a meal for two is around Rs. 400. This clean and unassuming restaurant whips up the most succulent momos. The food and the people will make you think you’re further east than you are. Wongdhen House is one of the oldest Tibetan restaurants here. Having a meal at the Wongdhen House will cost you under Rs. 300 for two. The view of the river is an added plus. This basement Coffee House with its yellow walls, wicker chairs and book shelf stacked with George Orwell is barely Tibetan. 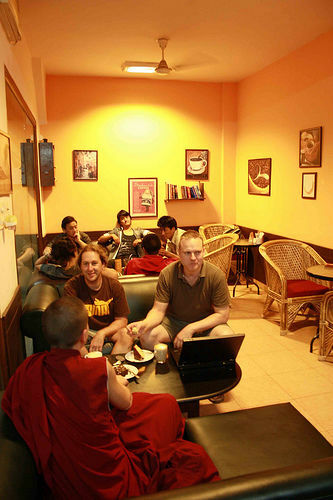 The only nod to Tibet in its menu is the delicious butter tea, a must try. Their selection of both tea and coffee is inexpensive and as tasty as any beverage in the city’s big coffee chains. Their bakery products are even better, with a very peculiar homemade taste. Try the buttery marble cake for just Rs. 20. 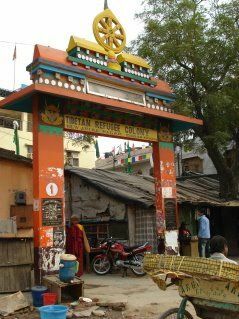 Majnu ka Tila is just a stone’s throw away from the Delhi University North Campus. Take the metro to Vidhan Sabha or Vishwavidyalaya and shell out an additional Rs. 30 for an auto or a rickshaw ride to this place.